John Lewis or Sainsburys? “Social Mention” Decides. You undoubtedly will have seen the plethora of Christmas adverts that have been plastered on your screens the past week, plus their social media push of course. Yep, it’s that time of year again. However, there were two adverts in particular that certainly caught the eye of us at home. So which advert has made the biggest impact online? I’m going to let Social Mention decide who stole christmas (as well as our hearts, of course). John Lewis, of course, are the Christmas advert aficionados who have blown us away once more with another tear-jerking, heart-warming, nostalgia inducing tale. This year they present us with a young boy and his CGI penguin pal named Monty (#MontyThePenguin) who throughout their travels is pining for true love. But hold the phone, Sainsburys, who are often dwarfed in the Christmas advert season by the “big boys” like John Lewis and Coca Cola (whose advert is notably un-notable this year), may have produced a winner. The advert depicts the astonishing impromptu truce between the British and German Troops that occurred on Christmas Day 1914, with the hashtag #ChristmasIsForSharing. Social Mention describes itself as a free real-time social media search and analysis tool. Essentially, it allows you to enter keywords on a subject and view a variety of statistics based upon who is saying what about the subject. Social Mention can be used to research brand reputation, trends in your customers, studying your current and potential reach and a bundle of other features. So, let’s take a look. Strength represents the likelihood that our brand is being discussed within social media. John Lewis comes on top with a massive 65%, which should not dwindle the also respectable 40% from Sainsburys. This is likely to be because of the previous reputation of the John Lewis advert. Not all is lost on Sainsburys part, though. Passion measures how many of the individuals that have mentioned the advert are mentioning it on multiple occasions. 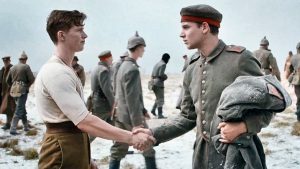 In saying that, it is no surprise why Sainsburys have found themselves with passionate watchers after cleverly releasing a WWI advert shortly after remembrance day, the 100th anniversary no less. As sentimental as it is however, John Lewis trumps them once more in that department. Sentiment on Social Mention is the ratio of positive mentions to the negative. Whilst most people are talking about both adverts in a positive manner, more so in the favour of connoisseurs of the Christmas Advert industry. Now, finding out that John Lewis are once more the kings of Christmas Adverts is simply dipping a toe into the sea of potential uses of Social Mention. Whilst tracking your brand reputation can often feel like an uphill struggle, it is vital that you do so; which is why tools like this are brilliant. If you want to enquire further about how Social Mention can help your business, or anything else for that matter, ensure you get in touch. Happy Holidays. Next PostCould ‘Facebook at Work’ make LinkedIn obsolete?